Ecological Threat: When escaped from cultivation in pasture, can invade and outcompete native grasses in bluestem coastal prairie communities. Biology & Spread: Prolific seed producers. They begin flowering in the spring, and seed in the summer. Seeds are readily transported by wind. U.S. Habitat: Thrive under grazing conditions and require full sunlight. Have low tolerance to acidic soils and high tolerance to drought and cold. 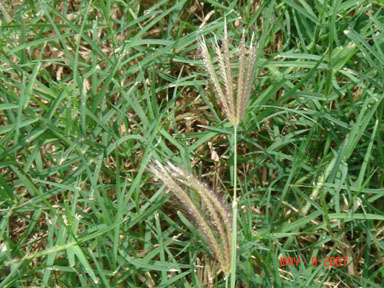 Distribution: Kleberg's bluestem is only found in Texas and Louisiana. If the plant is less than two meters tall, hand pulling may be possible. Use a foliar or cut-culm treatment of 1.5% or 27 - 40% glyphosate, respectively. The Quiet Invasion: A Guide to Invasive Plants of the Galveston Bay Area. Lisa Gonzalez and Jeff DallaRosa. Houston Advanced Research Center, 2006.